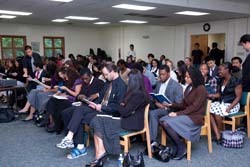 Approximately 90 college-aged young adults gathered at Mt. 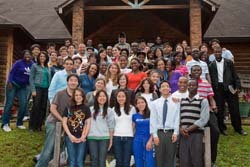 Aetna Camp and Retreat Center in Hagerstown, Md., for the third annual Adventist Network for Evangelism by the Word (ANEW) fall conference. 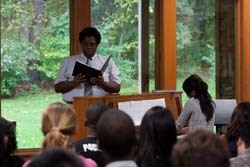 Under the theme “Dedication and Leadership,” the event inspired and equipped Seventh-day Adventist students to be committed to the Lord’s work through campus ministry. 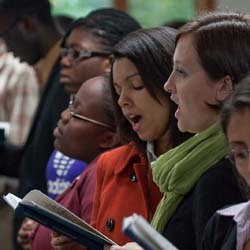 Attendees represented nearly all eight conferences of the Columbia Union and about 20 different secular campus universities and colleges, some from as far away as New York. Speakers were professionals from two Adventist organizations: Sebastien Braxton, director for STRIDE (strideonline.org), and Sikhululekile “Sikhu” Hlatshwayo, administrative secretary for CAMPUS (campushope.com). 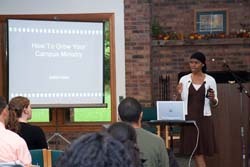 “Both speakers successfully educated and encouraged the young people through their messages and workshops. 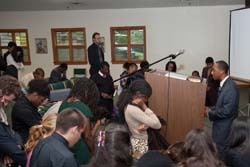 As a result, many decisions for Christ were made,” reports Jacqueline Rivera, ANEW’s vice president of communications and a member of New Jersey Conference’s New Brunswick Spanish church. 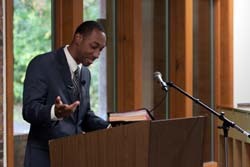 For more details about ANEW, visit anew-web.org.